In the early days of open plan, designs were little more than a kitchen and separate dining area with a wall removed between. Central islands became popular but design unity was not high on the agenda. With busy lives, we are time short and spending time together as a family has become increasingly difficult. Today’s Open plan space creates the heart of the home, a central hub in which everyone can cook, eat, socialise, work and spend together. Today’s open plan seeks to create one space that flows harmoniously from one defined area to another. Furniture style designs with open display areas, wall hung cabinetry and sophisticated colours are now utilized to create contemporary cohesive spaces. Unifying design in the open plan space creates a hub, a central area in which everyone will naturally migrate towards. It’s almost as if we’ve taken a leaf out of office kitchen design (depending on the size of the office! ), which often incorporates large open space for the numerous employees – However the actual design would be very different! Dining areas can be perfect places for homework, whilst relaxing on the sofa chatting to those cooking in the kitchen is appealing for today’s lifestyle. Unified design creates harmonious spaces, storage is maximized and thus clutter minimized and with this, a sense of calm is created. Today’s open plan is all about creating spaces in which people want to spend time. The simplest and most effective design trick is simply frame of mind. Seek to design a singular open plan space with living zones within. This changes the mindset from integrating to creating. The judicious use of both handleless and handled fronts can create a seamless flow from one area to another whilst defining separate areas. For example, handlessless fronts that move from kitchen to living dispense with traditional concepts of kitchen cabinets. By using the same fronts in different sizes and additional handles in a media are can create enough differentiation without harming overall design. The integration of additional elements such as contrasting colours, texture and display are important tools in defining areas whilst maintaining cohesive design. 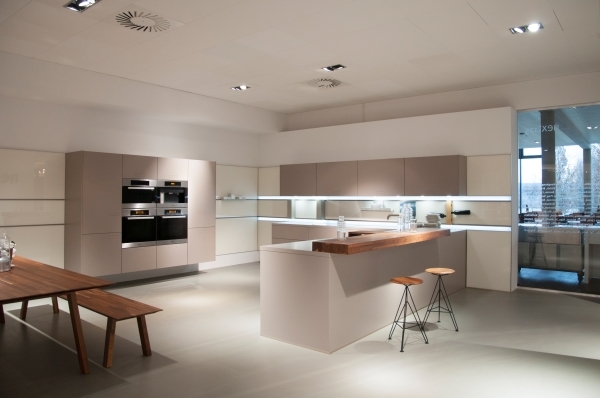 What are the key trends for 2015 – is it wood veneers, white cabinetry, matching worktops, pocket doors etc.? 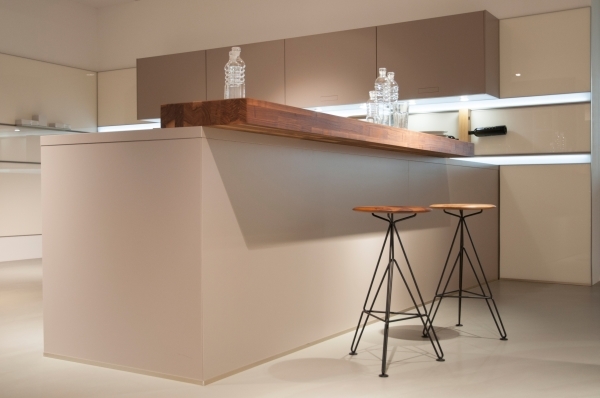 Wood veneers are huge for 2015, with use extending from cabinet fronts to wall panels and shelving. Worktops extend from counter surface to display and island units take on table style for future designs. 2014 is all about creative use of planning, of thinking outside the box in how individual elements can work together in a space that meets the needs of all that use it. Kitchen design is less about the kitchen and more about creating the heart of the home.